Joanne ____ is one of America’s twelve million illegal immigrants. She was brought to the United States from Mexico as a baby by her parents. She has a younger sister and brother who are American citizens because they were born in the United States. Her sister is in her last year at Harvard; her brother is in high school. Five years ago alumni of the North Hollywood High School Class of 1957 decided, as part of their 50th reunion, to give a scholarship to a deserving senior. The school’s top choice was Joanne, and so she was awarded the scholarship. With that financial help and her own tenacity and hard work Joanne got her degree from the California State University, Northridge, a year ago. She’s spent much of the past year looking for work, but it’s been a hopeless case because she can’t produce the necessary papers. 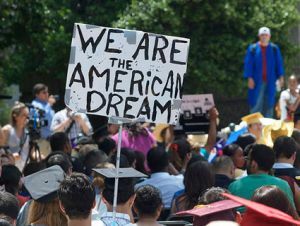 Until yesterday, when President Obama announced that the United States would no longer consider deporting people like Joanne—people who had been brought here illegally as children, earned a high school diploma or GED, or served in the military, and had behaved well—had what we would call a record of good citizenship, were they citizens. Moreover the government will give them permits to work in the US for two years, renewable indefinitely. After Top-Level Struggle Confronted with evidence of widespread corruption in Mexico, top Wal-Mart executives focused more on damage control than on rooting out wrongdoing, an examination by The New York Times found. The headlines are from Saturday’s New York Times. 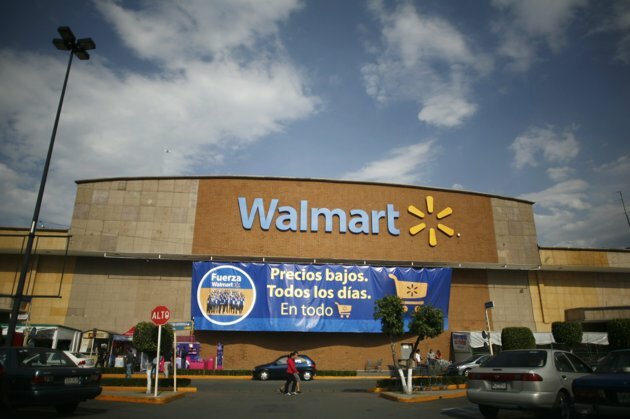 The news article details how Walmart de Mexico—that nation’s largest employer—regularly paid huge bribes to Mexican government officials to approve permits for new stores; how senior management of the Mexican subsidiary was party to the bribery; how Walmart headquarters in Arkansas investigated the allegations of bribery, and how, when the investigations turned up hard evidence, hq proceeded to bury it. “It’s not the crime, it’s the cover-up.” So goes the conventional wisdom, but in this case it was both: the crime was committed by top management of the Mexico subsidiary, and the cover up was by top management of the parent company. In my business ethics courses we use Walmart as a case study: Is the company ethical or unethical, and is it good or bad for America. When you make a mistake the ethical thing to do is to correct it as best you can and take action to prevent a recurrence. Right? Not if you’re the head of FIFA, the world’s soccer federation (football everywhere but in the USA) running the world’s biggest—by far—sporting event. 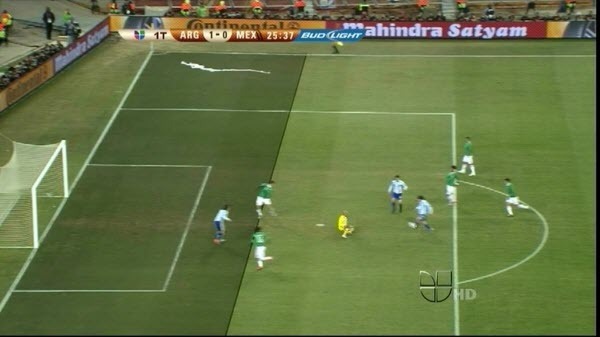 The 2010 World Cup in South Africa has been beset by ugly and blatant refereeing errors that cost the USA team a win against Slovenia, and disadvantaged England and Mexico in their losses to Germany and Argentina. The most egregious error was the referee disallowing a clear England goal when Frank Lampard’s shot hit the crossbar and bounced a good yard beyond the goal. Instead of tying Germany, 2-2, a disappointed England team went on to lose, 3-1. Just three hours later, another referee gave Argentina a go-ahead goal on a ball hit by a clearly offside Carlos Tevez (see photo). When the Tevez play was replayed on the stadium’s giant TV screen, the fans erupted and the Mexican players protested to the referee. But the referee held his indefensible ground. FIFA’s response? “FIFA will not make any comments on decisions of referees on the field of play.” But they did admit one mistake: close plays are not to be shown on stadium TV screens anymore, because it incites fans and leads to on-field arguments. Yes, the truth often does that.